I signed up for the August Postcard Poetry Fest — write a short poem per day, copy it onto a postcard, and send it off into the wild. 31 little poems, how hard could it be? HARD. I hadn’t written a poem since college… well, the occaisional haiku, a few lascivious limericks. But this exercised mental muscles I hadn’t worked in years. But I struggled through. So for the next 31 days, in addition to my regular birdy posts, I’ll be putting my poems here with a photo or two. Here goes! I was planning a silly post about Grumpy Birding, the days when I’m just not into it, but things got rather crappy on my walk and I thought I’d rather write about everything I did wrong. Instead of walking a mile, I walked 3 1/2 miles, the last mile across fields. Between 11:00 and 1:00. 93°F. 77° dew point (seriously, I didn’t think it was possible for the dewpoint to get that high around here). Heat index: 105°. In long pants. With no water. Did I mention I left my phone in the car? About the only intelligent thing I did all day was remember bug spray, since the mosquitos were biting right through my sweat-soaked and clinging clothes. And to top it off, the birds had better sense than I did, so the woods and fields were almost silent. 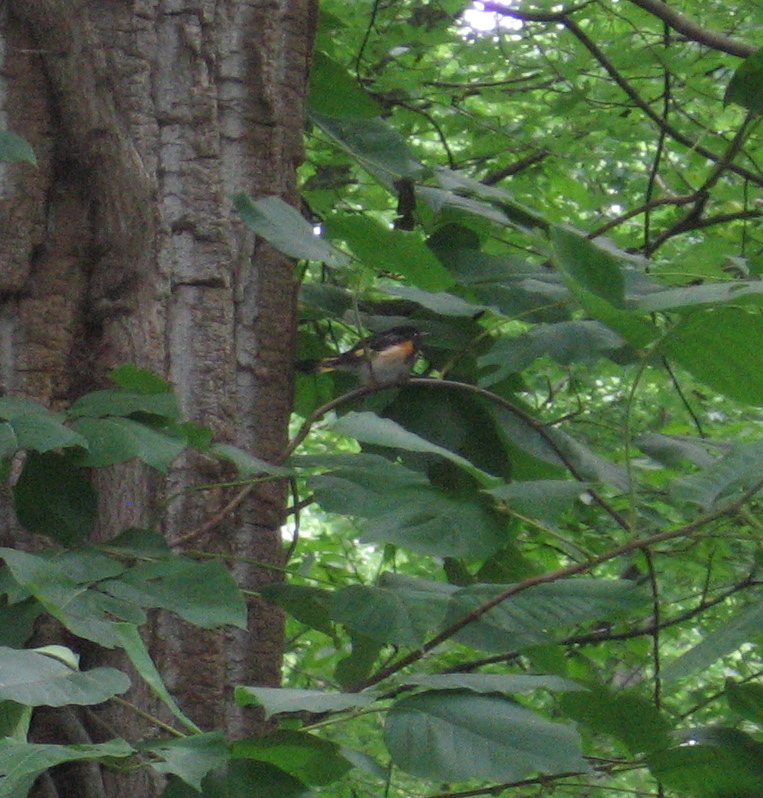 Here’s an American Redstart. That’s as exciting as it got today. Things should be cooler and more productive this weekend. And with luck I’ll remember to bring my brains with me. Species count was only about 20 including Black-throated Green Warblers, an adult Bald Eagle and one American Kestrel, plus some unidentifiable flitters high above me. Arthropod count = 0. Thank god, I don’t think I could have dealt with ticks on top of everything else. I try to justify my actions by considering that, compared to much of the US, we are living small. Our house is compact, under 1000 sq. ft. Except on the hottest days, we cool with open windows and ceiling fans. In winter we thoroughly insulate the leaky windows, hang blankets over the basement door, and rarely run the heat over 60°. The driveway is shovelled by hand, our only power yard tool is a push mower, and we’re not out there obsessively shearing, fertilizing, and poisoning the yard. 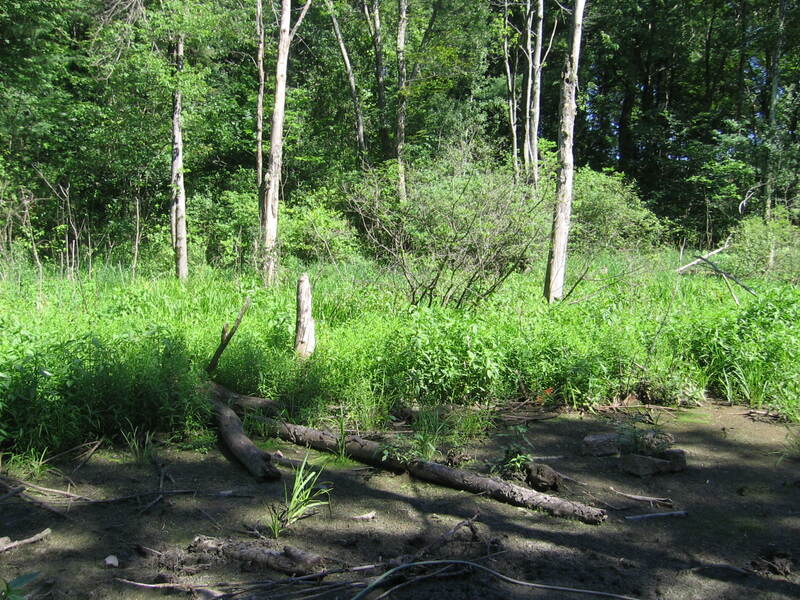 We compost, plant wildlife-friendly shrubs, and keep a big brushpile and a shaggy verge around the pond. Much of what we buy is second-hand. We recycle and repurpose things past use, and donate what’s still good. By the standard of most of the world, of course, we are shamefully self-indulgent. I know it, and as I watch the oil spread over the Gulf, I’m bathed in good old liberal guilt. I should be doing more, but life is so much easier with a second car! I really want that fresh fruit in winter! Dammit, I’m hot as hell and I don’t want to take it any longer! So… I do what I can. Or what I’m willing to do. I hope I know the difference. 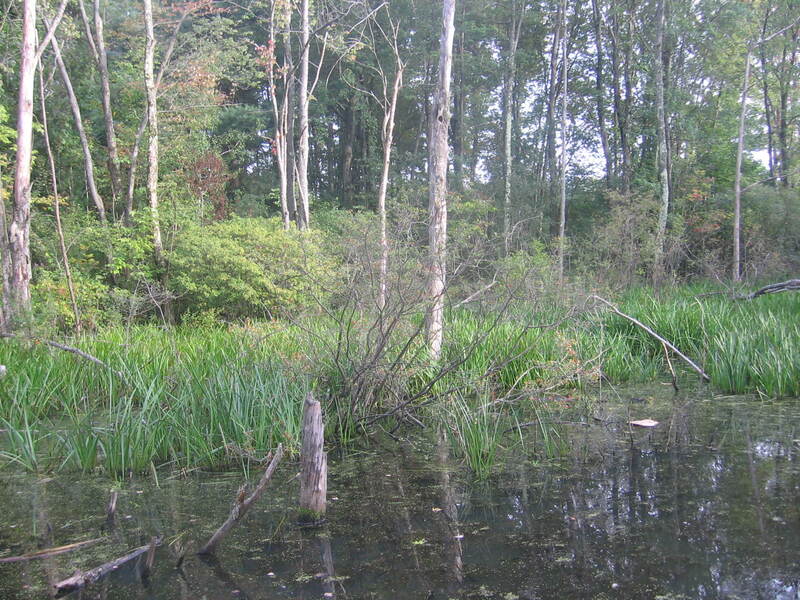 When we moved in, the swampy area behind the pond was strictly a vernal pool. By late summer you could walk across only slightly mucky-footed. Then Randall became fascinated with tadpoles, turtles, salamanders and all the rest of the herp crew. We closed the culvert and allowed the swamp to fill. Eventually it was over 2 feet deep and flowed over one side of the berm during deluges. Last year we had some exploratory work done on the septic system and realized it had water where it oughtn’t to be. The water table in the lower part of the yard was way too high (something I’d been saying for years as I squelched along the clothesline). After a lot of anguish, handwringing and “Where is the culvert, anyway?”, we drained the swamp, and while not quite up to our asses in alligators, we did spend a lot of time netting out all the inhabitants and releasing them in the larger pond. It’s been a dry spring and summer so far, and we’re forecast a week of 90 and above with no rain in the forseeable future. The swamp is dry. Raccoon and muskrat footprints crisscross the mud, while holes show where they have dug up crayfish and other critters trying to survive by burrowing. Catbirds also relish the easy-to-catch tadpoles wriggling in wet spots. It’s the change you see after a beaver dam breaks. Sorry, woodpeckers. I have to take the suet down. Even commercially-rendered suet won’t stand up to a week of high 80s/low 90s. I promise, when it cools down, you’ll get the good stuff again!